Ideally located, surprisingly quiet...Walk out the front door of this chic designer apartment and you are literally at the Spanish Steps. Matched with the highly desired area of Rome, the beautiful interior design and a terrace that looks out onto the Spanish Steps, this is a rare and wonderful place to call home during your Rome vacation. Right outside your door is the Keats-Shelley Memorial House, Giorgio de Chirico House in the 17th century Palazzetto del Borgognoni, the famous fountain Barcaccia, and Babington's Tea Room. Not to mention the Via Condotti, Italy's most famous shopping street. The immediate neighborhood includes La Dolce Vita's Via Veneto, the Villa Borghese gardens and Musuem and the oldest cafe in Rome, Antico Caffe Greco. A short walk to the Trevi Fountain and the Campodiglio from here as well. 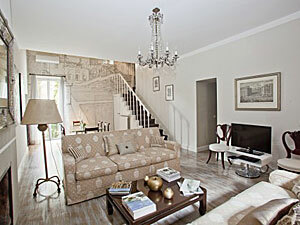 This luxury apartment has been restored by the interior designer owner to high standards. Matched with the highly desired area of Rome, the beautiful interior design and a terrace that looks out onto the Spanish Steps, this is a rare and wonderful place to call home during your Rome vacation. Whitewashed floors and light colored walls reflect the natural light from the large windows. Crystal chandeliers are understated, the modern fully functional kitchen will delight those foodies that enjoy shopping for delightful Italian products. The small terrace that overlooks the Spanish Steps offers privacy yet entertainment. You will really feel at home, in Rome, staying here. From the street level, two sets of stairs will take you up to the apartment. As you enter , the kitchen is on your right, and the living /dining room is straight ahead. From a hallway in the living room, you reach the Master Bedroom, a comfortable Queen bed ( 160 cm x 200 cm) and its en suite master bath with tub. From the living room, the second bathroom is located, this is a full bath with a beautifully tiled walk in shower. A staircase from the living room takes you up to the second bedroom, here you have a Double bed ( 140 cm x 200 cm ) and French Doors that lead to an outdoor terrace, with tables and chairs for al fresco dining, or just relaxing with a glass of wine. There are two sets of steps to reach this floor, while the apartment building does not have an elevator, the steps are an easy climb thanks to the wide staircase.